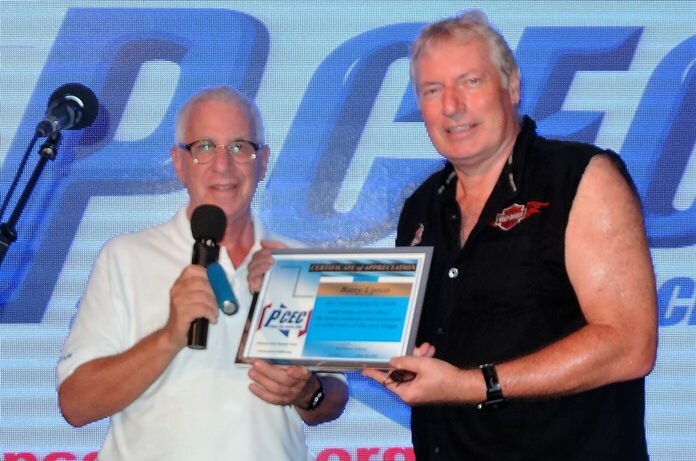 Barry Upton, well-known Pattaya personality, was the guest speaker at the June 5 meeting of the Pattaya City Expats Club. He gave an insider’s perspective of the history of the music industry, while entertaining the crowd with some of his new songs that are still in the development stage. 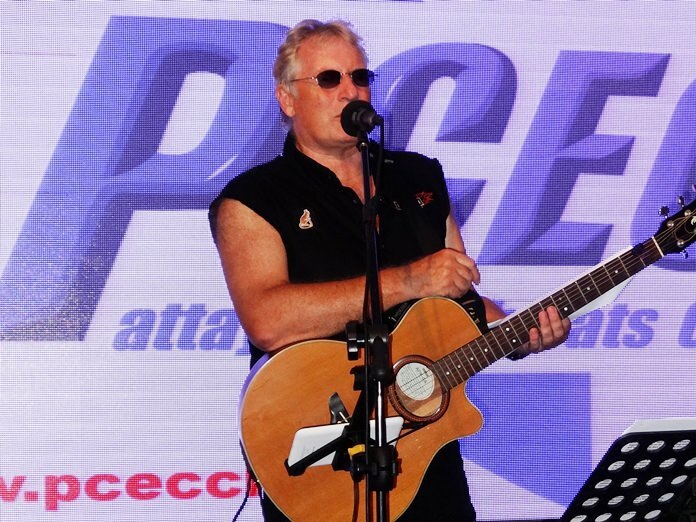 Well known Pattaya Musician and DJ Barry Upton entertained the PCEC with some of his new songs and provided some tidbits about the music industry. “I’ve been in the music business all my life,” said Barry. “Since the age of 21 I’ve never had a proper job. I think one of the reasons I’ve survived in the music business is because I love it.” Versatility is the key, according to Barry, who has been a music producer, music arranger, songwriter, performer, nightclub DJ, radio presenter, and TV presenter, and has worked with every genre of music from pop to classical. Barry noted he never gets tired of performing. Keith Richards has been a great inspiration. “If he can still do it, everyone can.” Barry said people don’t realize how much preparation goes into a performance. Each one is a new challenge. MC Richard Silverberg presents Barry Upton with the PCEC’s Certificate of Appreciation for presentation at the Sunday, June 5, meeting. “I’ve seen many good musicians in this town, but they only play one kind of music,” said Barry. My advice is versatility. Don’t just stick to music you know.” Further, he considered the Beatles to be masters at that; they took rock, blues, and psychedelic music and mixed it all together. “Something strange is happening in the music business: vinyl is making a comeback,” said Barry. “People ask why I don’t have a stage name. It’s because I wanted to see my name on the record jacket.” He felt the younger generation is realizing the joy of physically handling a vinyl record. Although writing new songs is one of Barry’s favorite aspects of the music business, he mentioned that today people are buying old music. “New music isn’t interesting enough,” said Barry. A decade ago, new releases were outselling old ones. Now, only 30 percent of streaming is new music. Part of the reason, he believes, is that there’s no investment in new talent. Years ago, he said, a company would keep an artist on hold for two years, developing them until they were ready for prime time. Member Roger Fox interviews Barry Upton after his presentation to the PCEC. To see the video, visit https://www.youtube.com/watch?v=7ODozB4OwqI. In the old days, he noted, musicians would make money from recordings, not from live performances, which were just a means to get people to buy the recordings. Now, Barry said, that has completely reversed: with all the new methods of downloading music from the Internet, musicians make their money from performances instead of recordings. According to Barry, Prince was a groundbreaker in realizing that you can’t make money with recordings anymore. Everyone thought Prince was crazy when he gave his recordings away with newspapers – that is until he then sold out 21 days of huge live performances. Barry said song writers can also give away their music, then earn money by creating their own vehicle. For example, last year he talked to PCEC about forming a lady boys’ pop band in his spare time. The band cut an album, “Girlz,” which is available on YouTube, etc. His next plan was for the band to do shows, but he found out that lady boys are unreliable; each one wanted to go a different county, and he couldn’t get them together in one place long enough. Now he has a new project, working on a movie, for which he is writing all the songs. He performed one of them, “Hot Summertime Love,” which he said might be title of the movie. Barry ended his presentation by singing along with the video “Pattaya Wonderland.” The video was taken on Pattaya’s Walking Street, and it features Barry singing the popular “Pattaya” song – which he wrote – along with a host of dancing Pattaya characters. Visit https://www.youtube.com/watch?v=bnw3nssuTTg to view a video of Barry singing his song, “Pattaya Wonderland.” Barry currently performs at “Secrets” on Walking Street every Friday evening. 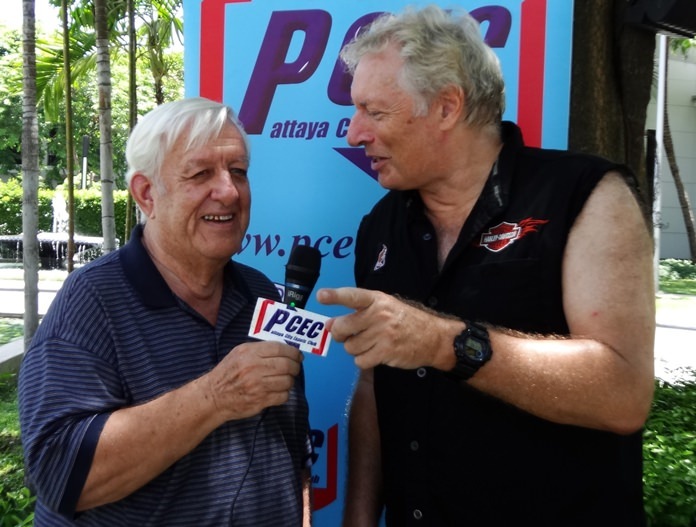 After the presentation, MC Richard Silverberg brought everyone up to date on club activities and happenings around Pattaya before calling on Ira Wettenstein to conduct the Open Forum, where questions are asked and answered about Expat living in Thailand, especially Pattaya.